For the last two weeks, we have been exploring the Nu-Metal scene which was a scene that I heavily promoted on my early college radio show from 2000-01. One of the bands that I was admittedly obsessed with back in those days was the band Ultraspank which formed in 1995 after the break up of another band. On May 30, 2000, the band would release their most critically acclaimed album Progress which featured Pete Murray (Vocals and Programming), Dan Ogden (Bass), Jerry Oliviera (Guitar), Neil Godfrey (Guitar), and former Snot drummer James “Fed” Carroll. The album was produced by the great Peter Collins who had produced albums for bands such as Alice Cooper, Gary Moore, Rush, Queensrÿche, and so many more. I can’t find much online as far as the band’s chart history or how many albums the band sold, but it is considered by some critics as the best Nu-Metal album that was ever released. My Final Thoughts– The track features so many sounds that would be utilized in the scene right after it’s release and you can definitely hear the similarities with bands on the scene. This was an amazing release and it’s too bad that the band would break up shortly after the release, but those things happen. Check this one out on Spotify, iTunes, and on CD if you can find it. I am going to give the album 4.5 stars out of five. For this week’s Based On A Truesday (play on Tuesday and True) Story film, we are checking out a film that is outrageous you thought it was impossible that someone could possibly live the life this man lived. 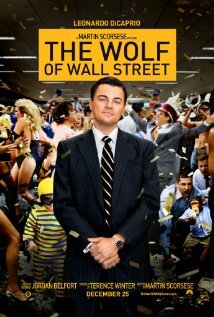 The film is called The Wolf Of Wall Street and it stars Leonardo DiCaprio as stock broker Jordan Belfort who starts his career as a honest stockbroker until a chance encounter with penny stocks sends him on a journey that will see him rise to new heights with money all the way down to his fall with corruption, drugs, and the government. The man had it all, but like everyone who gets greedy, they get sloppy and eventually the empire crumbles down leaving you broke and humble. The film was directed by the legendary Martin Scorsese (Goodfellas) and it also stars Jonah Hill (Superbad) as Donnie Azoff (looesly based on Danny Porush), Margot Robbie (Pan Am) as Naomi Lapaglia, Matthew McConaughey (Dallas Buyers Club) as Mark Hanna, Kyle Chandler (Zero Dark Thirty) as Agent Patrick Denham, Jon Bernthal (Fury) as Brad, Jean Dujardin (Monuments Men) as Jean Jacques Saurel, P.J. Byrne (Horrible Bosses) as Nicky Koskoff, Kenneth Choi (Captain America: The First Avenger) as Chester Ming, Brian Sacca (The Kings Of Summer) as Robbie Feinberg, Henry Zebrowski (A To Z) as Alden Kupferberg, Jake Hoffman (Click) as Steve Madden, and Mackenzie Meehan as Hildy Azoff to name a few from the long list of people that acted in the film. As I said in the above paragraph, this is a story that is so outrageous that you almost don’t believe that it’s possible that someone lived the lifestyle that Jordan Belfort lived. Of course that is why the films always say that it is BASED on a true story because not all of it is 100% factual, they have to exaggerate on somethings just to make the movie more interesting. One person who didn’t like the film was Andrew Greene who feels they ruined his personal character, but it’s really how they made fun of Nicky “Rugrat” Kos­koff’s wig that really pissed him off. You see the character of Nicky is based off of Andrew Greene and he is suing them for $25 Million dollars. According to Slate.com, “landing the helicopter on his lawn while stoned, crashing his car while severely high on Quaaludes, insisting that the captain of his massive yacht sail through choppy waters only to have the boat capsize and then get rescued by the Italian navy” stories are all true and it was even verified by the FBI agent on the case. Danny Pourish who is known as Donnie Azoff was married to his cousin, but he didn’t meet Jordan in a restaurant, but says that his wife introduced them. He has admitted to eating the goldfish, but denies having a three way with a teenage employee and Belfort. Besides all the fact and fiction stories that can be discussed about the film, it is a tale of total debauchery and it had masterful performances from Hill and DiCaprio. I was mad at first that DiCaprio didn’t win the Oscar for this performance, but I’m over that after watching Dallas Buyers Club. You can tell the film was done by Martin Scorsese because it has that style where the main character is narrating his life throughout the film and it starts at certain points before going back to explain how they got there. The film is available on Netflix and I suggest checking it out as well as reading this article for more fact or fiction on the film by clicking here. I am giving the film an A for a final grade.